Listening to Al Bowlly, one might not guess that he was born in Mozambique of a Lebanese mother and Greek father. His singing betrays no trace of a South African accent, even though he spent much of his early life in South Africa and toured with various bands before coming to Britain in 1928. He was nicknamed the British Bing Crosby and, indeed, there were similarities in that both vocalists were crooners, specialising in singing sentimental songs, with occasional jazzier moments. And Bowlly was one of the first singers - like Bing Crosby and before Frank Sinatra - who became a star in his own right. This was not always easy for band vocalists in the 1930s, who were habitually considered subservient to the rest of the band. This tendency is shown in the way that vocalists of the period usually got to sing in the middle of an arrangement, seldom being allowed to bring a song to its climax. Yet Bowlly's voice was utterly distinctive and instantly recognisable. He had star quality in the clarity and tenderness of his vocals, his clear enunciation of lyrics, and his friendly personality. The fact that he could also play several instruments meant that his performances were consistently musical. He had started singing in South Africa, where he also learnt the banjo, ukulele and guitar, with which he used to entertain the customers while working as an apprentice at his uncle's barbershop. He came to London as a fully-fledged artist and was soon performing and recording with bands led by the likes of Fred Elizalde, Ray Noble, Roy Fox and Lew Stone. You can hear his mature sound in the earliest recordings on this double CD: Time on my Hands and Goodnight Sweetheart from 1931. The tracks are usefully arranged chronologically, except for the famous title-track from 1932 which opens the album. This compilation includes most of the Bowlly favourites you would expect, including Lady of Spain, Sweet and Lovely, Guilty, Hold My Hand, The Very Thought of You and The Isle of Capri. There are some surprises, like Nat Gonella adding his own throaty vocal to Lying in the Hay, and Al performing the Shakespeare song It Was a Lover and his Lass (as set by Arthur Young) - with Ken "Snakehips" Johnson and his West Indian Orchestra. There are not many touches of jazz, although there is a good alto sax solo on Gotta Date with an Angel and some impressive drumming (probably Bill Harty) in Sailin' on the Robert E. Lee. It has to be admitted that some of the songs are trite and long-forgotten - and deservedly so, yet Bowlly delivers them with convincing charm. And the bands that Al recorded with (especially Ray Noble's) supply sympathetic backings. 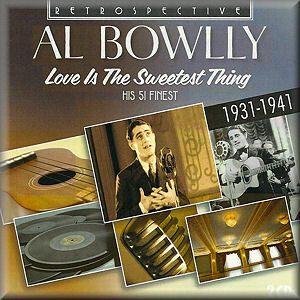 The 51 tracks on this generous collection prove that Al Bowlly was not only a sweet, alluring singer but also a very versatile one - coping with everything from such romantic ballads as Love is the Sweetest Thing and Penny Serenade to comical songs like Irving Berlin's When That Man is Dead and Gone (a reference to Adolf Hitler). Al Bowlly is dead and gone - but certainly not forgotten.